I got these jeans the day before at E Street Denim. I love this store! What I love even more is a great sale. Jeans were all 50% off and if you buy 2 or more pair they were 75% off! I just got one pair, but I'm in love with the wash and color. I also love that I don't have to alter these, as I alter most of my jeans! Double yay! You look so cute and happy! Love your top! Cool outfit, I like it! Come back soon to visit my blog, I'll be waiting for you!! simple, effortless and yet such an adorable look! striped shirts are simply always right. eek, i love these casual looks! and isn't E street awesome?! i worked with the owners in college, great store! 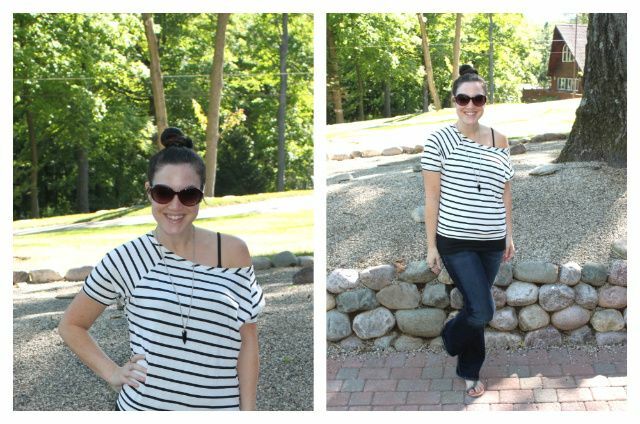 love the off-the-shoulder striped top! isn't it great finding jeans...that are cheap...and don't need alterations?? !